Heated seats are now standard. Parking System Plus (front and rear parking sonar), heated front seats and a 12-way power front passenger seat are now standard. Homelink is now standard on Prestige. Heated seats are now standard. Parking System Plus (front and rear sonar warning system) is no longer standard on Premium. The A4 was all-new for 2017 and now its gained a new entry-level engine. 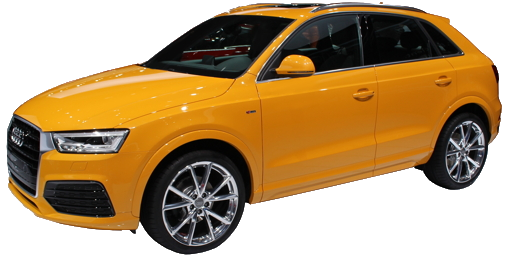 The 252-horsepower 2.0-liter turbo standard last year (2.0 TSFI) is now only available with Quattro all-wheel drive. It is still offered with a 6-speed manul or a 7-speed dual clutch automated gearbox. New for 2018, front-wheel drive models steel an engine from the Volkswagen GTI. Rated at 190 horsepower and 236 lb.-ft. or torque, the 2.0-liter turbo is designated 2.0 TSFI ultra, to help keep it separate from its more powerful big brother. A new, smaller brake system rounds out the deconting of the A4 FWD. It now stickers about $2000 less than last year. Heated front seats are now standard. Satellite radio is extra cost. 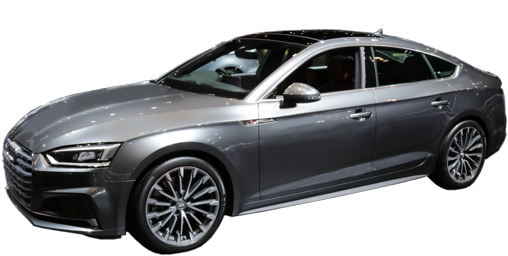 Adaptive cruise control, Audi Active Lane Assist, High Beam Assist, heads-up display and Parking System Plus (front and rear parking assist sonar) were optional on Prestige; now standard. 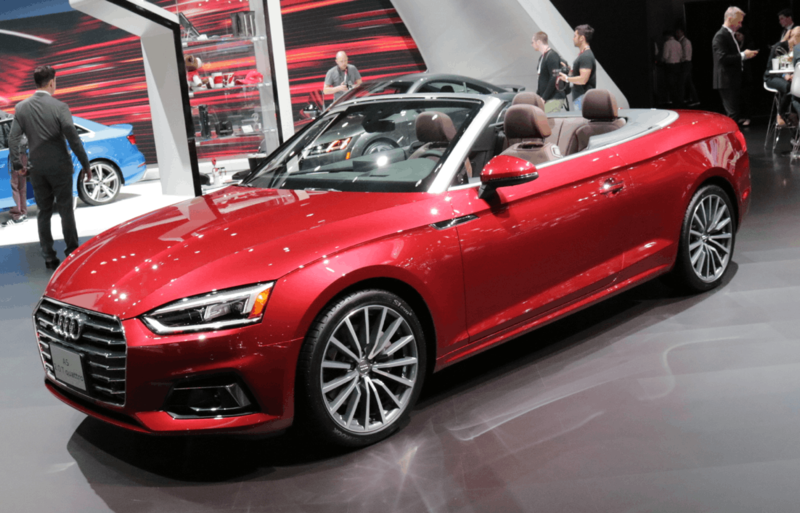 An all-new model, it still comes as a coupe or a convertible, but now a "Sportback" five-door hatchback is also offered. 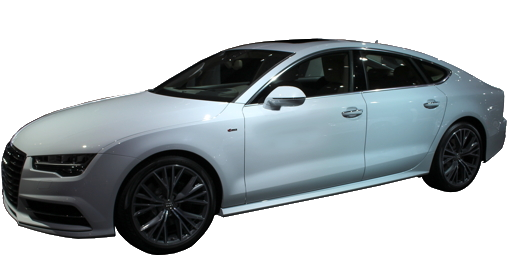 Similar in concept to the A7 "Coupe" the A5 Sportback have 35 cubic feet of cargo space with the rear 40/20/40 seats fully folded. The 2.0-liter turbocharged, direct injected 4-cylinder gains 32 horsepower and 15 pound-feet of torque, now 252 @ 5000 RPM and 273 ft.-lbs. @ 1600 RPM. The optional automatic transmission is now a dual-clutch automated gearbox instead of an 8-speed automatic. Fuel mileage improves 1 MPG city and highway with the 6-speed manual (24 city/33 highway), and 2 and 4 MPG city and highway, respectively with the automatic (24 city/34 highway). Brakes are larger by almost 6% in the front, 10% in the back. The wheelbase and overall length are somewhat larger which results in a slightly clumsier turning circle: 37.7 feet, curb-to-curb. The previously optional state of tune available in the competition package is now the standard state of tune to the 3.0 supercharged V6, with 340 horsepower and 325 ft-lbs of torque. Navigation with MMI touch control with handwriting recognition and full voice control, Audi smartphone interface with Apple CarPlay and Android Auto, and Audi Advanced Key (hands-free opening and starting) are now standard. 21-inch wheels are now also offered on 3.0T, with summer tires. Heated front seats are now standard. A heated steering wheel is now part of the Cold Weather Package. 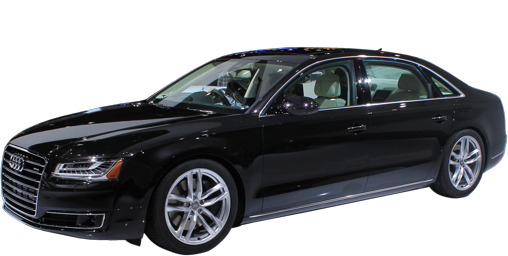 Audi Lane Assist, Adaptive Cruise Control and auto high beams are now standard on Prestige. A top view camera system is now offered: standard on Prestige. Decontenting allows a lower price for the Q3. Previously standard items are now optional: power liftgate and compass. 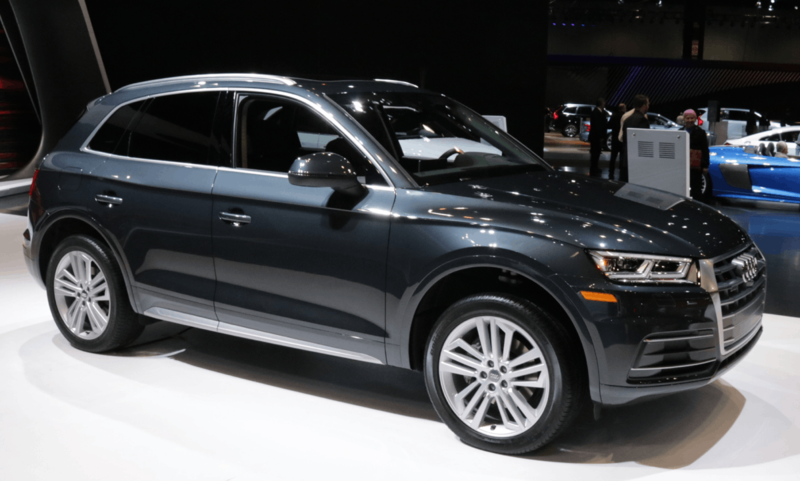 The Q5 is significantly new for 2018. Its 2.0-liter turbocharged, direct injected 4-cylinder gains 32 horsepower and 15 pound-feet of torque, now 252 @ 5000 RPM and 273 ft.-lbs. @ 1600 RPM. The 3.0T supercharged V6 is gone. 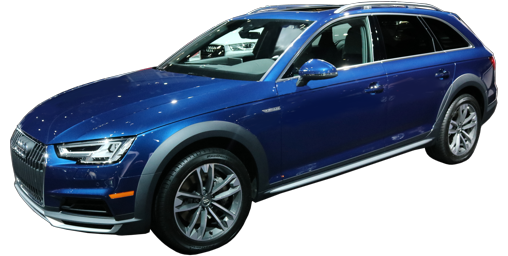 Like the A5, which shares this powertrain, the Q5 trades its 8-speed conventional automatic for a dual-clutch seven-speed. City fuel mileage is up three: 23 city/27 highway. The 2.0T's brakes are significantly larger than last year's 2.0T's: 13.3 front/13 rear, still smaller than last year's 3.0T's brakes. Maximum cargo space with the rear seats folded is now 60.4 cubic feet a difference of more than three cubic feet. Outer dimensions don't change much, an inch longer (half an inch longer wheelbase), slightly wider turning circle and 0.3 inches more minum ground clearance. A new telematics with emergency response if an accident is detected is optional: AudiConnect CARE. Other newly available safety features include Lane Departure Warning, an exit warning (warns of cars approaching when opening a door) and rear cross path warning to warn if cars are coming from the side when backing up. Four-wheel steering is now optional on the Prestige. 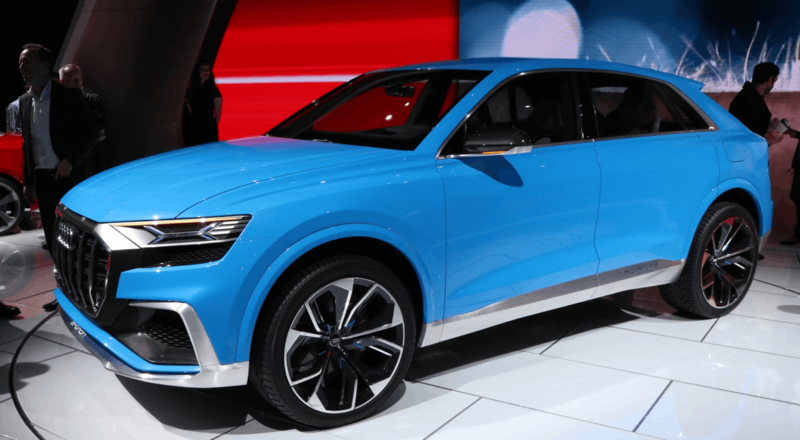 Shown as a concept at the 2017 Detroit Auto Show, this would be the new halo for the Q-range of Audi crossovers. 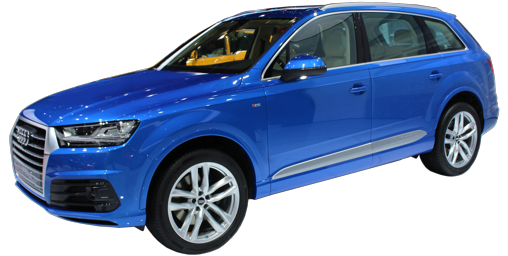 Porobably offered with the 3.0T engine, it is a stretched version of the Q7, but with a lower, sportier roof-line. 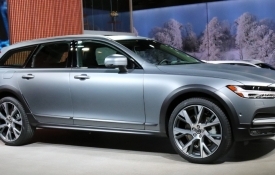 It may offer a 4.0-liter V8 or even a W12. 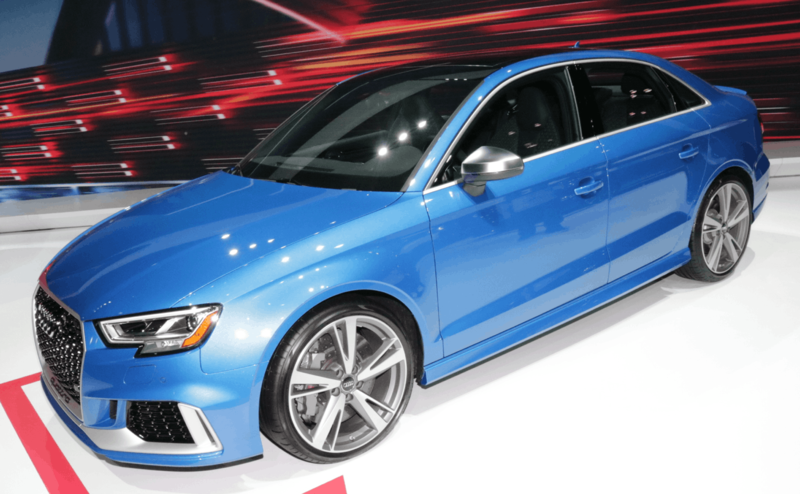 This new pocket rocket merges the S3 sports sedan but replaces its pretty-good 2.0-liter 292-horsepower 4-cylinder is replaced with a 400-horsepower turbocharged 5-cylinder. Now unique to Audi, the 5-cylinder has a distinctive sound all its own and is actually related to the engine in the Lamborghini Hurican. 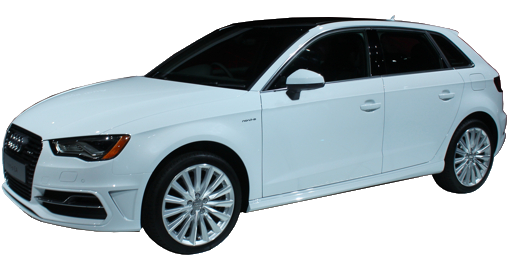 Quattro all-wheel-drive is standard as is a seven-speed dual-clutch gearbox (automated). Huge 14.6 brakes, a stiff suspension with adaptive shock absorbers and 235/35R19 tires complete the package. 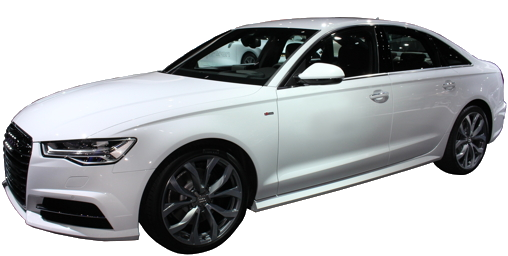 The highest performance Audi sedan is mstly unchanged. The 275/30R21 tires on 21-inch wheels that were previously optional are now standard, replacing the 20-inch wheels. A seven-speed dual clutch automated gearbox replaces last year's six-speed. City fuel mileage improves by one MPG: 22 city/28 highway. Audi Side Assist (Blind spot warning system) and Rear Cross Traffic Warning are now standard. Homelink is now standard on Prestige. The mean version of the A5 is just as all-new. It comes in Coupe, Cabriolet and Sportback. 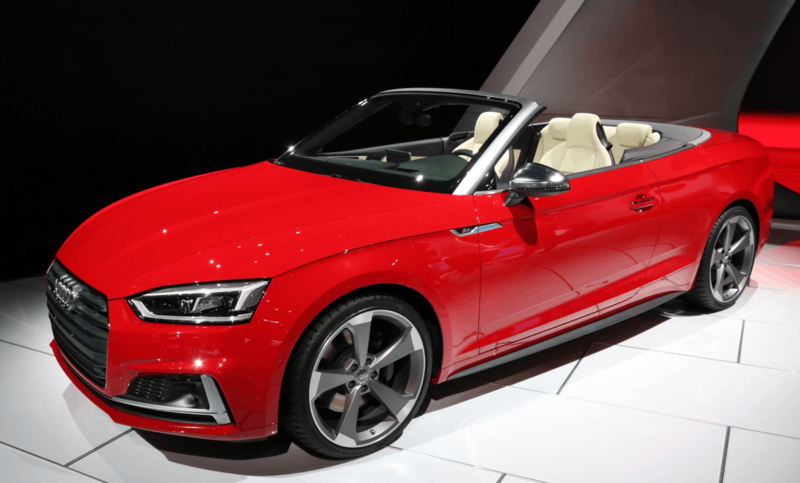 The S5 trades its supercharged 3.0 V6 for a new single turbocharged engine with more power (354 vs. 333) and torque (369 vs. 325 pound-feet) and better fuel mileage (21 city/30 highway for the Coupe and Sportback, 20 city/29 highway for the Cabriolet). Collision Warning and Pre Sense City, a low speed automatic braking system, are now offered: standard. 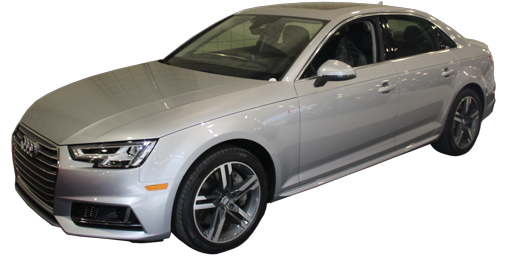 More standard equipment: Parking System Plus, with front and rear sonar warning systems (rear only was offered as an option on the 2017 S5); backup camera, voice control, and Blind Spot Warning. A new hands-free trunk is standard: kick your foot under the bumper and it unlatches and opens. A heated steering wheel is now offered. Full LED headlights are now standard. The 265/35R20 tires and 20-inch wheels previously optional are now standard, replacing the 19-inch. 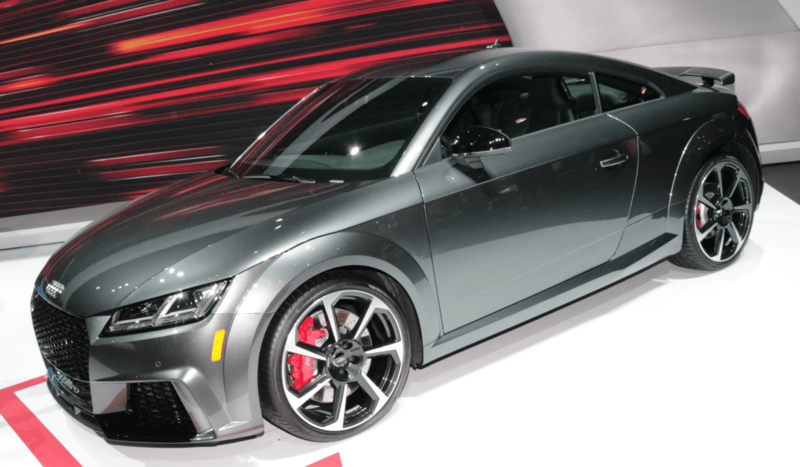 The big news is the TT RS is back! A much improved, all-aluminum 5-cylinder turbo makes 400 horsepower and 354 pound feet of torque. Shared with the new RS 3, this engine finally utilizes an aluminum block. Larger (14.6 inches) front brakes and optional carbon ceramic front rotors round out the package, that otherwise shares dimensions with the TTS. New S line competition package on all models includes flat-bottomed steering wheel, sport suspension, red brake calipers and various trim pieces. Audi Parking System Plus (front and rear parking sonar) and auto dimming exterior mirrors are now standard. Apple CarPlay and Android Auto smartphone integration is now available.